This is part five of the series “Building Land in Coastal Louisiana: Expert Recommendations for Operating a Successful Sediment Diversion that Balances Ecosystem and Community Needs.” See previous parts on the Sediment Diversion Operations Expert Working Group, Hydrodynamics of a sediment diversion, Geology of land building using sediment diversions, and Building land while balancing historic and cultural effects. In the last 50 years, coastal Louisiana has lost about 20% of its wetlands (see map), which is an area about the size of Delaware. In most other coastal areas, wetland loss happens abruptly because of conversion to homes, harbors, shrimp farms, etc. 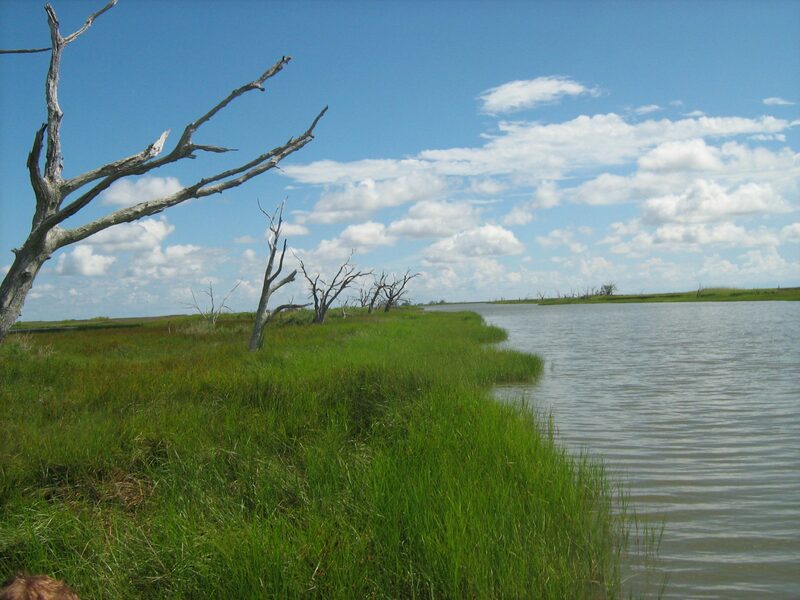 Here in coastal Louisiana, however, most wetland loss happens gradually because of conversion to open water due to some natural processes and human alteration of other natural processes. Simply replanting vegetation fails to restore wetlands because the open water areas are too deep to support even wetland plants. In the next 50 years, Louisiana is expected to lose another 15% to 32% of its emergent marshes and to gain more open water. Wetlands are classified by the differences in the way they look and by how they affect storm surges, fish and wildlife. On the Atlantic coast, people generally talk about fresh marsh and salt marsh, but here in Louisiana, salt marshes are subdivided into three types: intermediate, brackish, and saline marsh (see map). The boundaries between these vegetation types move because river flow and rainfall fluctuate, but the trend is clear: as Louisiana loses all types, fresh marshes are losing ground to the saltier Spartina marshes (Table 1). For this reason, dead Live Oak (Quercus virginiana) trees are a common site in Louisiana saline marshes (Figure 1). Table 1. 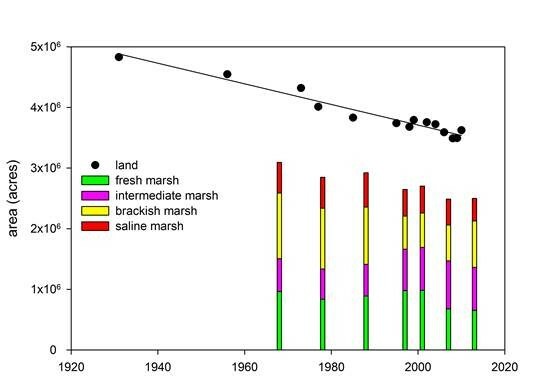 Changes in the relative abundance of marsh types and the amount of land in coastal Louisiana; swamps are not included. Creating new wetlands requires filling open water with sediment to near the average high tide level. The biggest source of sediment is the Mississippi River. Dredges and pumps can be used to move sediments up and over levees, or, gravity can be used by removing a section of the levee or putting a gate in the levee that can be opened and closed; these techniques are called uncontrolled and controlled diversions, respectively. Dozens of small, uncontrolled diversions have been used since the 1960s to create new wetlands downstream of Venice, LA. These diversions have been large enough to each create hundreds of wetland acres but they have not altered salinity because river water already dominates this region. However, the large, controlled diversions being planned approximately half way between New Orleans and Venice will discharge into waters that currently are salty enough to support salt marshes in existing wetlands. Reducing salinity on existing wetlands will increase plant productivity and may allow less salt-tolerant plant species to replace existing salt-tolerant species if salinity is reduced year round. However, the diversion will also increase water levels, especially near the diversion location. This will decrease plant productivity and could eventually drown existing wetlands. For this reason, the Sediment Diversion Operations Expert Working Group recommended focusing operations during the winter when the plants are dormant. During the growing season (April to October), diversion operations would be limited to shorter periods. Limiting operations during this time will slightly reduce the already slow process of wetland building but may allow existing marshes more time to gain elevation by accumulating sediment and thus reducing loss of wetlands to flooding. Stay tuned for the next post in the “Building Land in Coastal Louisiana” diversion operations series! For more information about the Sediment Diversion Operations Expert Working Group’s key recommendations, visit http://www.mississippiriverdelta.org/diversion-ops-report/. Dr. Visser is an Associate Professor in the School of Geoscience in addition to being Associate Director of the Institute for Coastal and Water Research at the University of Louisiana at Lafayette. She received the equivalents of a B.S. and M.S. degrees in Biology from the University of Amsterdam and her Ph.D. in Marine Sciences from Louisiana State University. During her more than 25-year career working in coastal Louisiana, Dr. Visser has authored numerous reports, papers, and book chapters related to coastal wetland ecosystems and coastal wetland restoration. She chairs the Coastal Wetland Planning and Protection Act (CWPPRA) Academic Advisory Group (since 1999). Dr. Visser has been an advisor on several coastal wetland restoration planning efforts, and has made significant contributions to restoration outcome forecasting. Her research interests include wetland vegetation, seabird breeding habitat, and monitoring. Andy Nyman, Ph.D., has been studying Louisiana’s wetlands since 1987 and interacting with wetland restoration programs since 1993. He has published over 65 peer-reviewed articles and chapters with graduate students and other collaborators. His most cited papers address oil spills and marsh vertical accretion, which allows coastal wetlands worldwide to offset some global sea-level rise and local subsidence. His publications include a text book chapter on managing coastal wetlands in the Wildlife Management Techniques Manual. His most recent publications address the effects of nutrients on wetland vegetation and attempts to use leaf-tissue chemistry as a restoration-planning technique much as is done in agriculture. He is a wildlife professor at the School of Renewable Natural Resources at Louisiana State University and also moonlights as the sole employee of River Oaks Wetland Services, Inc. providing expert consulting and expert witness services.